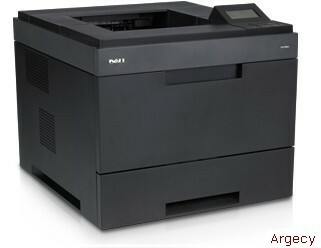 The 5330dn is a lightning-fast, high-performance network printer that delivers professional results, page after page. Print speeds up to 50 ppm (letter) (Actual print speed will vary with use) churn out laser-sharp documents and help reduce wait time. 600 x 600 dpi native print resolution generates sharp text and impressive detail. Say goodbye to bottlenecks at the print queue thanks to swift Gigabit-NIC enabled networking featuring 1 Gigabit/sec transfer rates from PC to printer. Manage, monitor and generate reports for your entire printer fleet with DellTM OpenManageTM Printer Manager network utility. An affordable price and low printing cost offer great initial value and excellent long-term savings. A 250,000-sheet monthly duty cycle and standard 10K or high-capacity 20K toner cartridges help keep your print station open for business. The optional 500-sheet drawer and optional 2,100-sheet high-capacity paper feeder let you expand the 5330dn to accommodate up to 3,200 sheets. A 4-line backlit LCD screen gives instant access to the intuitive menu. Standard two-sided printing helps reduce paper waste and encourages in-office recycling on the spot. Paper drawers support recycled paper. The multiple-sheet feature allows you to print numerous pages on a single sheet. The 5330dn is ENERGY STAR compliant and up to 25% more power efficient than conventional models. Raw Speed – Print speeds up to 48 ppm generate high-quality documents in no time. Excellent Quality – 600 x 600 dpi native print resolution produces crisp text and razor-sharp graphics. Dell Reliability – An impressive 250,000-sheet monthly duty cycle helps keep you up and running. Serious Value - Enjoy long-term savings with a low cost per page and a very affordable price. Wireless Freedom – Print without cables from anywhere in the office (Require the optional Dell Wireless Adapter and a wireless network). Go Green – Double-sided and thumbnail printing reduces in-office waste. Print speeds up to 48 ppm (Actual print speed will vary with use) churn out laser-sharp documents and help reduce wait time. Manage, monitor and generate reports for your entire printer fleet with Dell™ OpenManage™ Printer Manager network utility. Efficient, high-volume mono laser printing is now available for your business. Take advantage of the internal USB Wireless Adapter and print from anywhere in the office without cables. An optional 600-sheet extender can increase your paper output to an additional 950 sheets. Dell business machines are built to deliver peace of mind. In addition to its proven reliability, the 5330dn is backed by a solid warranty and some of the best technical support in the business. Rest assured with the standard 1-Year Limited Hardware Warranty and 1-Year Next Business Day On-Site Servicenbsp;that helps you minimize downtime. For additional peace of mind, protect your investment with an optional 5-year limited hardware warranty extension. Receive free fuser replacement for the life of your warranty. Dell’s optional installation service lets you relax while professional technicians get you up and running. Get high-level tech support from ISF-certified technicians, optional on-site exchange and diagnosis, collaboration support on third-party software and much more with optional Dell ProSupport Printer Services, For additional information, see www.dell.com/prosupport. Standard two-sided printing helps reduce paper waste and encourages in-office recycling on the spot. Paper drawers support recycled paper. The 5330dn is ENERGY STAR® compliant and up to 25% more power efficient than conventional models.